I earned my Bachelors of Professional Arts Degree in 1968 from Brooks Institute of Photography in Santa Barbara California. I am currently a Certified Master Photographer with the Professional Photographers of America. I was married in 1971 and my wife, Marian, instantly became an integral part of my photography endeavors. She has worked by my side during our many amazing adventures. 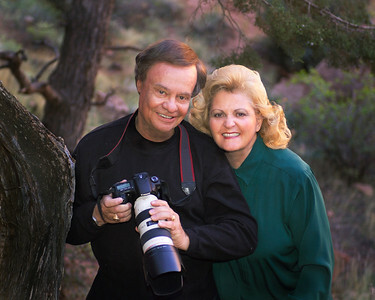 We have owned and operated several Photography Studios in the Salt Lake City, Utah area. In the year 2000 we sold our last studio, Mar Del Photography. We purchased a Condo in Puerto Vallarta, Mexico and moved there in 2002 where we set up Artistic Photography by Dale, a web based photographic business. Our new studio was designed and created by Mother Nature. During our marriage, we have had the opportunity to tour many countries by land and by sea. I have been fortunate to have many of my photographs published in major periodicals throughout the World including The National Autobahn Magazine, and the cover and inside photographs of the Professional Photographers of America “Storyteller”. Among the awards I have earned were three “Kodak Gallery Awards” which resulted in my photographs being displayed three times at Epcot, in Florida’s Walt Disney World. We spend the winter months in Puerto Vallarta, and the summer months in Kansas City, Missouri.